Positive Singles is a safe dating community for those living with sexually transmitted infections. They refer to them as STDs, but sexually transmitted infections (or STIs) is the more accepted term now. At first blush it looks like any other dating site. Everyone is open about having an STI – no one is hiding it. That cuts out the feeling of pressure or unease you might feel on other sites. It’s peace of mind with all the usual dating services you’d expect. 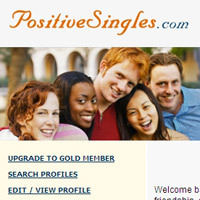 The profile quality at PositiveSingles.com is decent. You answer all the usual questions. Right off the top, though, you get asked to specify the STI that you have, such as Herpes Type I or II, HIV, Chlamydia or thrush. This dating site only works if you’re open about your situation. If you’re not comfortable with that level of openness, it won’t work for you. Other than that, the profile questions run like most other dating sites and the profile quality is about the same, too. Presentation is a little lacking on Positive Singles. It’s not a slick site, but it certainly gets the job done. Still, getting the job done may not be enough to compete with some of the major players in the long run, but this site’s niche has limited competition. So, it’s less about sleekness and more about community. They’ve added an STI counselor service and STI news, plus members’ blogs give you a sense of support. There are enough search options to make it easy to find someone special. Unfortunately, the most detailed ones require you pay in order to use them. Free members can search by age and within a 100-mile radius, but that’s it. If you want to hand over the money, you can filter through all the options you filled out when you signed up and narrow results to within 50 miles of home. There are keyword searches for finding those profiles with elusive interests. Just keep in mind that, again, you need to upgrade to use them. A larger problem is that you also can’t see last login info until you’ve paid for a subscription, which makes figuring out the level of activity in your local area difficult. The site’s price went up a while back and at that time the number of visitors to its pages declined. Since then, there has been a small increase in people viewing the site. Still, I’d make sure to look around and run enough searches for people in your area before you make the leap. Positive Singles offers a sense of community and has grown to a modest level of popularity.